People say that the place serving the best Black Forest cake (or Black Forest Gateau as many call it) is without a doubt the Black Forest in Germany. 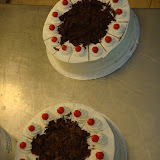 There are many stories surrounding the question on how the Black Forest cake got created for the very first time. One thing for sure – unless you use Schwarzwaelder Kirschwasser (Black Forest Kirsch) in the cake, it will not be a real Black Forest Cake. For some insights on the process of making the cake and the ingredients please have a look at our videos below (unfortunately they are in German, but we are sure you can figure it all out just by watching). If you are interested in attending a hands-on baking class, join us on one of our Cake Baking Tours during your next Germany vacation!